Donatos recently provided pizza to these students at Washington Middle School as they celebrated “Pizza with the Principals.” This is in appreciation for their selection as Students of the Month for November. They are chosen by their teachers because of the outstanding example they set for their peers in such areas as academic effort, good work ethic, kindness to others, and service to their school. Pictured from left: Toby Mitchell, Allie Mongold, Tristan Hammock, Jozlin Quarles, Mr. Wayne, Principal, Samantha Dallmayer, Gabe Perez, Desaray Williams and Gaven Lyons. 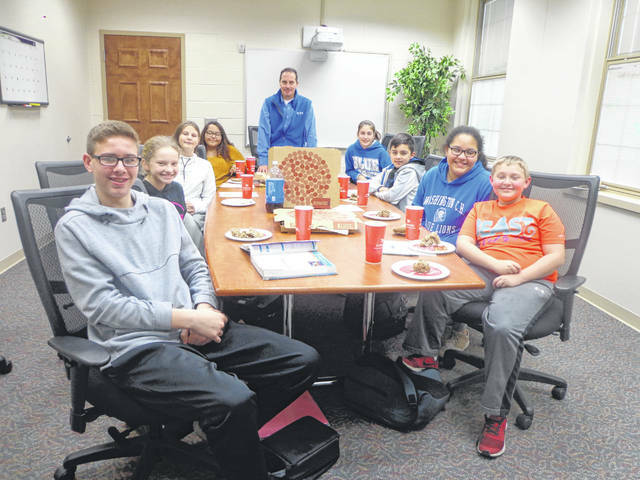 https://www.recordherald.com/wp-content/uploads/sites/27/2018/11/web1_November.jpgDonatos recently provided pizza to these students at Washington Middle School as they celebrated “Pizza with the Principals.” This is in appreciation for their selection as Students of the Month for November. They are chosen by their teachers because of the outstanding example they set for their peers in such areas as academic effort, good work ethic, kindness to others, and service to their school. Pictured from left: Toby Mitchell, Allie Mongold, Tristan Hammock, Jozlin Quarles, Mr. Wayne, Principal, Samantha Dallmayer, Gabe Perez, Desaray Williams and Gaven Lyons.